Apparently, even sell-out corporate shills have their breaking point. 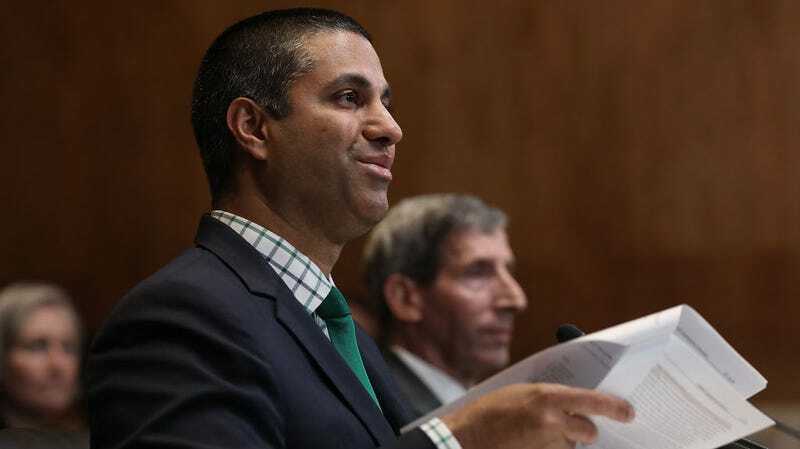 Ajit Pai’s FCC released documents on Thursday that explain why it’s sending Sinclair Broadcasting’s proposed takeover of local news in the U.S. to a judge for further review. Defying all expectations, the deal now looks like it’s next to dead. Before today, there was plenty of reason to believe it was a bad idea to let Sinclair skirt regulation with a loophole and have stations available in 72 percent of American households. One reason is, that’s almost twice the reach federal rules allow one company to control (the standard federally mandated limit is 39 percent); another reason is, Sinclair is a brazen conservative propaganda outlet that forces good reporters to debase themselves; on top of that, Pai, the FCC’s chairman, managed to land himself under investigation for allegedly improper coordination with the broadcasting company after he revived the very loophole that would have put Sinclair in two-thirds of Americans’ living rooms. Virtually the same concerns are involved with the examples of stations in Dallas and Houston that were set to be sold off to Cunningham Broadcasting. A Sinclair associate named Michael Anderson allegedly bought $400,000 worth of Cunningham shares at a rate that was allegedly far below market value. I’m just going to run this example of incestuous corporate ownership in the FCC’s own convoluted words: Another point of concern is “the fact that the children of Sinclair’s controlling shareholders are beneficiaries of trusts controlling the non-voting shares of Cunningham with the parents holding options to buy the voting shares in the future.” On top of all this, Sinclair would still retain the right to buy back the stations in the future, according to the FCC. Sinclair quickly tried to restructure all of this in a less shady manner on Wednesday in the last-minute hope that it could still win the FCC’s favor. Despite Sinclair’s shock and begrudged effort to appease the FCC, it appears to be too late. The FCC filing states, “Although these three applications were withdrawn today [Wednesday], material questions remain because the real party-in-interest issue, in this case, includes a potential element of misrepresentation or lack of candor that may suggest granting other, related applications by the same party would not be in the public interest.” To put it another way, Sinclair may be too sleazy to even deal with going forward. We were unable to reach a Sinclair spokesperson by phone for comment on the FCC’s filing, and the company did not immediately respond to an email requesting comment. We will update when we hear back. Of course, bad actors can oppose other bad actors sometimes, and it’s worth noting that one of the parties that called this deal a “sham” in a complaint to the FCC was the conservative organization Newsmax. That company is a rival of Sinclair, and it also happens to employ one of Donald Trump’s golfing buddies, Christopher Ruddy. According to the New York Post, Ruddy claims he’s discussed his opposition to the merger with the president “a few times.” Throw in Pai’s inspector general investigation for alleged improper coordination with Sinclair, and it’s easy to see why the big-mug-sipping doofus might want to let a judge rule on this whole thing.